Helbio participated in the Hannover Messe, the world’s leading trade show for industrial technology that took place in Hannover, Germany from the 1st till the 5th of April. Hannover Messe is Europe’s largest hydrogen and fuel cells exhibition and this year had more than 6.000 exhibitors and 200.000 visitors. Some of the exhibition’s topics are: Hydrogen generation, Hydrogen storage and transport, Fuel cell systems and applications, Components and supplying technology, Fuel cell and battery testing. 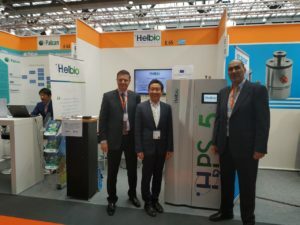 Helbio exhibited the technology of H2PS-5, a CHP unit, which is manufactured by the company. H2PS-5 is a multi-fuel system based on hydrogen and fuel cell technology meeting the needs of several markets for economical, efficient and green energy supply. 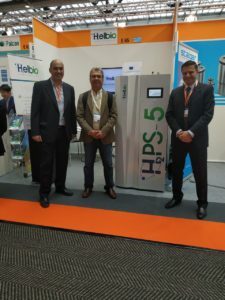 Helbio completed its participation at the Hannover Messe with great success, with many visitors showing interest and requesting to find out more about the H2PS-5 unit that was available for display at Helbio’s booth (E65) at Hall 27 while company’s profile and activities as well as the H2PS-5 kW system have been also presented in the Public Forum of the Hydrogen and Fuel Cell section of the exhibition.